Preferred Properties Landscaping & Masonry: Patios & Pavers - Nursery, Outdoor Lighting, Mulch, Gardening, Sod and more! Preferred Properties Landscaping can help you create that perfect outdoor living space with a beautifully designed patio. Our Landscape designers can look at and access all the elements including elevation, drainage, size, shape and texture of the patio all in effort to build the patio you deserve. A patio is an extension of your living space outside and can incorporate the most desirable features such as eating areas, spa and sunning areas and fireside relaxation with your family. Preferred Properties Landscaping designers know and understand backyards well. We have been designing and building decks and patios for over 20 years. There are lots of choices of stone materials, types of steps, joining materials and shapes to consider. A patio can be quite a large investment so you want to make sure you hire a competent installer. Textures of stones and installation procedures differ from that of bricks. You want to make sure there is accurate size in the patio to support your chosen furniture and lifestyle. In many larger homes, it is not surprising to build small living extensions off many spaces in different areas around the home. These patios can vary in size and function. More popular today are small gas fired pits and fire rings for family gatherings. Our task at hand is to educate the homeowner on the space and options possible to be incorporated with the patio. Trellis and arbor coverings are very desirable and expand the outdoor patio space. Offering shelter, shade, light and privacy, these trellis and pergola structures can vary in texture and size configurations. How Do You Start With The Ultimate Backyard Design? Hire a landscape designer. One who designs and builds patios for a living. A specialty of the designer is the experience that he/she brings to the table. Preferred Properties Landscaping have designed and built hundreds of residential patios and courtyards. Some simply furnished and some lavishly appointed. A patio is your own special space. Choose a designer that enables you to discover the possibilities. A talented designer has had the experience with all types of stone, tumbled pavers, granite and limestone. Preferred Properties Landscaping are experienced and competent in all the materials of the leading manufactures, quarries and stone suppliers. Sure we have chosen favorites but as this is your personal space we respect your choice and likes as well. If you have seen it, Preferred Properties Landscaping can build it. How Do You Enhance Your Outdoor Space? Preferred Properties Landscaping tries to incorporate the patio with distinctive and comfortable features such as sitting walls, the warmth of fire and night lighting. By raising the patio elevation and designing wandering steps onto another elevation, the interest of the patio is elevated. Curving sitting walls and supportive masonry columns help support the patio. A terraced patio or masonry deck is much more interesting than something simply flat. Widen the stairs, curve the approach and support it with creative plantings says APLD designer Bill Morrissey. Bill has designed and build award winning residential patio areas for Preferred Properties Landscaping over the past 12 years. Blessed with tradesman, masons and plantsmen, Bill has enabled the crews to work together under his design to exceed the expectations of the homeowner. Why Do Preferred Properties Built Projects Last So Much Longer Than That Of The Competition? Everyone at Preferred Properties Landscaping are trained and expect nothing less than the best in preparation for the aesthetic make over to come. Accompanied by on the staff masons, we are consistently reminded of the wrath that New England winters deal on masonry and stone projects. Corrective and preparatory measures in the base and construction of these patios are what distinguish them from the other patio projects. 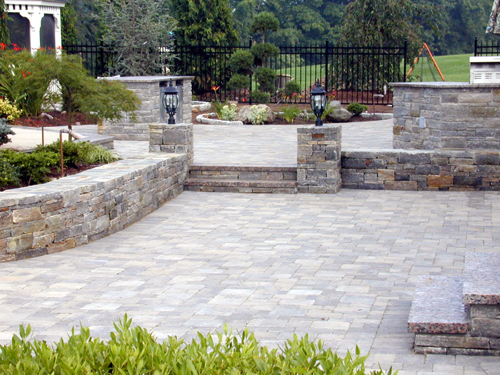 Our Preferred Properties Landscaping masonry team has been recognized by PEOPLE, PLANTS, and PLACES magazine as one of the most successful stone setting companies in New England. Stone built right will last a lifetime, stone built any other way will give you a lifetime of misery. With so many options and so many uses if your new patio space, why wait? Contact Preferred Properties TODAY to schedule your free site analysis. Every patio, courtyard terrace and surrounding landscape is built with night lighting in mind. One more aspect that Preferred Properties Landscaping can offer. All for you to enjoy especially because we realize you’re at home most when it is dark. A Preferred Properties Landscaping patio is a patio you deserve. Competent in using the most popular brick paver choices that Unilock, Nicolok, Belgard, ideal and Techo produce, it is up to you to pick a color and size brick paver you cant go without. 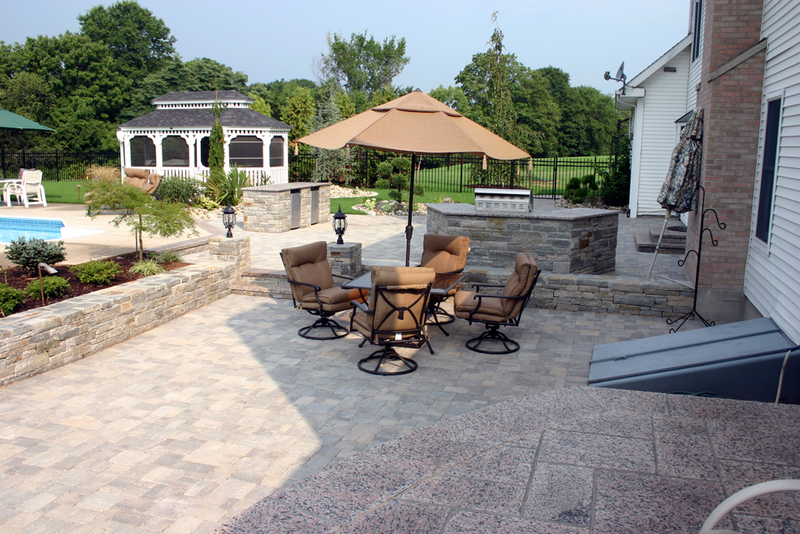 Call Preferred today and talk to a hardscape specialist that is willing to help you design the patio of your dreams. 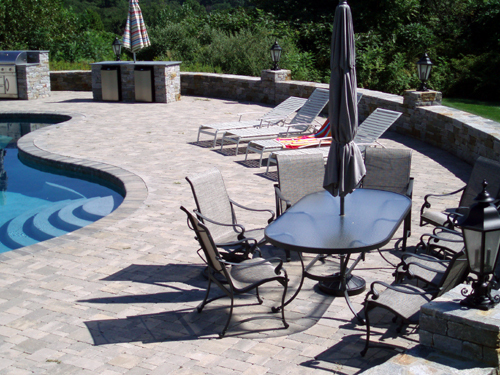 Preferred Properties has been an innovative leader in the construction of pavers and patios. AUTHORIZED and Competent for any paver/patio installation, Preferred has been recently acknowledged as five of their jobs were submitted for National recognition. Preferred is proud of their staff as they are simply the industry's best.